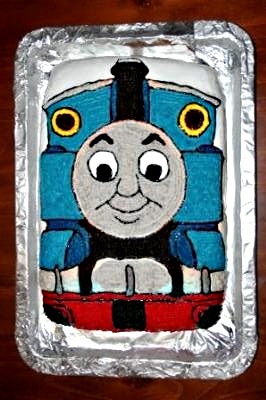 Thomas The Tank Engine was the theme for my son's 3rd Birthday. Other than the Thomas cake, I also made cupcakes topped with Thomas novelty rings, and the bunting was made from Thomas the Train Engine fabric! For the cake I used two packets of cake mix; one chocolate, and the other butter cake, and layered the batters. Once cooked and cooled, I used fondant icing over the whole cake. I found a picture of Thomas on the internet and enlarged it to fit A3 (11.69 x 16.54 inches) paper. Once the fondant icing was on, I placed the picture on top and used a toothpick to poke along the outline of the picture onto the icing. I used a black icing-pen to draw over the indentations made by the toothpicks of the Thomas outline, and then piped the coloured icing on the cake. It was very time consuming due to the number of different colours used. It was a hot and humid night, so I put the cake into the fridge whilst making the next batch of coloured icing. Black icing can be found at Coles. Allow plenty of time, and enjoy!! 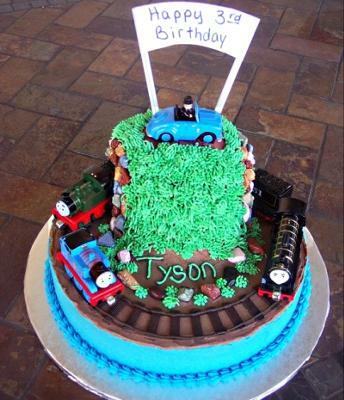 Thomas the Train lovers are going to love this cake! 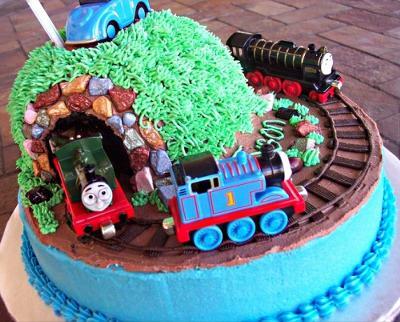 What a creative cake with such wonderful details like the cave, and Thomas on the tracks! Rebecca share some details on how she made this Thomas cake. The cave on the Thomas cake was a 2-layer 6" cake that I carved into a dome. I don't care for the ball pans as I find that by the time the middle is baked through, the outside is over baked. I prefer a more consistent result. My husband built a chassis out of wood for the monster truck, and then I just stacked sheet cake layers (four, I think) and carved the monster truck shape. Then, yes, I covered it with fondant and did most of the decor with buttercream. Then I cut out the windows and replaced them with gray fondant windows which I brushed with piping gel to make them more shiny than the rest of the truck. The wheels are each one 6" cake layer on it's side, sandwiched between two wood rounds to keep them from getting smashed. Whenever I do vehicles, I take measurements from a model and try to build it to scale for a more realistic look. I took measurements for the bus from my nephew's matchbox bus, and measurements for the truck from my niece's big monster truck toy. Thanks Rebecca...your attention to detail is obvious in your cake! They are wonderful and we appreciate you allowing us to share your photos and details.